Sometimes the laptop screen can be overly kind to art. Just as internet dating promises everyone is a Venus or Adonis pictures in an exhibition can promise a thrilling assignation when you encounter them online. In the painted flesh you know immediately that this isn't going to work. Guy Maestri's exhibition, Google Earth, at Paddington's Tim Olsen Gallery looked so good in pixels, his eerie studies looking like strange inner visions, but face to massive face his overly large canvasses seem at once portentous and vapid. The show is made up of a group of largely monochrome paintings each of which give us single subjects or chamber pieces. 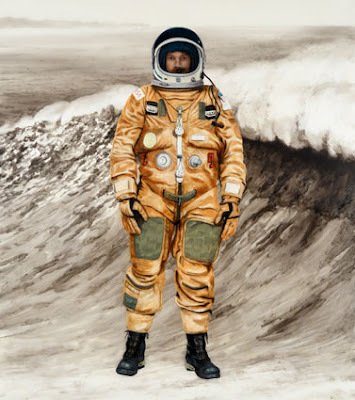 There are portraits, chimps, pandas, landscapes and a repeated interest of men in space or beneath the ocean. The work is painterly, in its rough canvasses, exposed grounds and occasional distempered effects it reminds us of the painter's craft and seems to claim a kind of authenticity in doing so. The problem is that these effects look veryself-conscious. 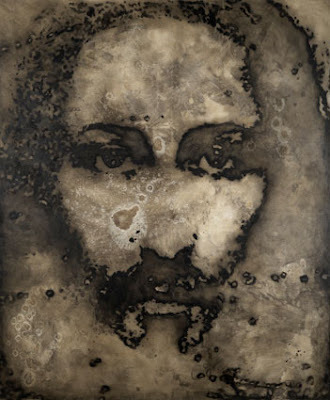 A face of Christ that's five feet high looks at once like a rorschach test, which might be interesting as we all have our own version of that particular saviour, but its rings of distemper are far more contrived than they are artful. There's also the question of size. Christ has a very big face, but it's not clear why. Mega-portraits are the bread and butter of portrait prizes like The Archibald, which Maestri won this year, but I always suspect that scale is intended to distract from vacuity, that a Mount Rushmore aesthetic is meant to overawe in the absence of insight. Maestri appears a one note paper here, he does big things. Whilst the work here is highly realistic Maestri is not immune to the curse of the ironically portentous title, two smoking chimps are 'The Great Apes' while a roller sakting relative is entitled 'The Ascent of Man'. I can't decide whether that just elevates the work into another, more precious, level of kitsch or if it is genuinely supposed to indicate some kind of profundity. 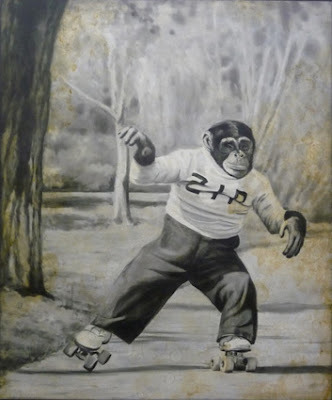 The fact is that a perfectly decent painter seems to picking up post-modern cues that make him look like a skateboarding pensioner. The traces of digital camera time-stamps in the corner of some paintings is a slightly embarrassing and vogueish addition that is really unnecessary, in fact it suggests and anxiety about relevance and contemporaneity. That so much is so obvious and trying so hard is a shame. 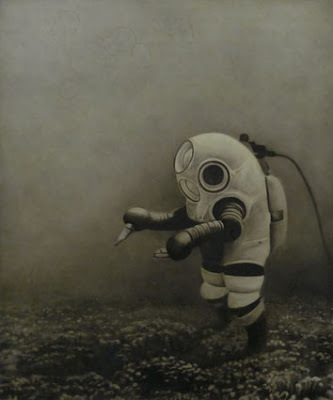 I have a sense that Guy Maestri does appear to have an eye for the strange, the eeriness of his diving suits promises much. He is an accomplished painter, but he sits in an odd middle ground where he has produced slightly odd subjects in a very traditional way, with ironic titles in a corporate art acreage. Good intentions aside these are easy kitsch, big pictures with small ideas.